Thomas J. Schmidt. Head of the Electrochemistry Laboratory and Rüdiger Kötz, Head of the research group Electrocatalysis and interfaces, were in charge of the characterisation of the novel aerogel catalyst at PSI. Credit: Markus Fischer/Paul Scherrer Institute. Fuel cells that convert hydrogen into power and only produce pure water as a by-product have the potential to lead individual mobility into an environmentally friendly future. The Paul Scherrer Institute (PSI) has been researching and developing such low-temperature polymer electrolyte fuel cells for more than 10 years and initial field tests have already demonstrated the successful use of these fuel cells in cars and buses. However, further research is still required to improve the durability and economic viability of the technology. An international team of researchers involving the PSI has now manufactured and characterised a novel nanomaterial that could vastly increase the efficiency and shelf-life of these fuel cells – as well as reduce material costs. In a hydrogen fuel cell, hydrogen is converted into power and water through electrochemical reactions. A key step in these reactions is the reduction of oxygen at the cell's positive electrode, where oxygen molecules fed into the cell are converted into water. As this reaction takes place very slowly under normal conditions, catalysts are needed to speed up the conversion process. In conventional cells, precious metals such as platinum fullfill this catalytic function. The thin nanoparticles used for this purpose are supported by a substrate typically made of high surface area carbon. However, the carbon substrate can easily become corroded during the common start/stop operation in city traffic or during idling; thereby compromising the function of the catalyst, which in turn shortens the service life of the entire fuel cell. Consequently, researchers have long been looking for catalysts for oxygen reduction that do not need a support and still display a high specific surface area with a large number of catalytic centres as well as good long-term stability. An international team of researchers involving the PSI has now made considerable progress in this direction. Using a three-dimensional aerogel made of a platinum palladium alloy, they were able to increase the catalytic activity for oxygen reduction at the positive electrode of a hydrogen fuel cell fivefold compared to normal catalysts made of platinum on carbon supports. This means that the same amount of oxygen can now be converted with only a fifth of the amount of precious metals. If this reduction of the necessary platinum load could be transferred onto an industrial scale, it would slash the production costs for these fuel cells. The aerogel, which is a kind of nanostructured foam, has also passed long-term tests in the lab, where the typical operating conditions in a vehicle were simulated. The aerogel now synthesised and characterised by researchers at Dresden University of Technology and at PSI forms a three-dimensional network of nanowires and it features a high porosity and large inner surface. The latter properties facilitate the adsorption of many oxygen molecules onto the catalytically active platinum atoms – a prerequisite for the efficient conversion of oxygen. 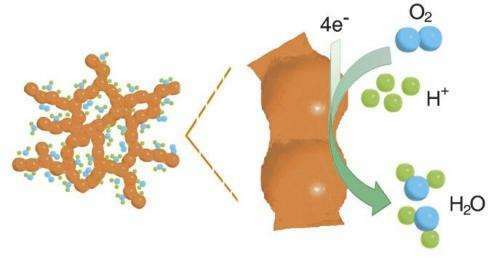 While catalysts used in commercial fuel cells also exhibit a high degree of porosity and large surfaces, they achieve that only when they consist of platin nanoparticles on a carbon substrate. The key advantage of the new aerogel is that it combines these assets with an extensive three-dimensional structure, which means there is no need for a support whatsoever. Because of its excellent properties for many applications in electrochemistry and sensing applications, aerogels have attracted a lot of attention in recent years. Numerous teams of researchers all over the world have been chancing their arm at producing new aerogels, mostly safe in the knowledge that useful applications will follow. Until now, however, their success has been limited to a small group of chemical substances: most aerogels are made of oxides or single metals. 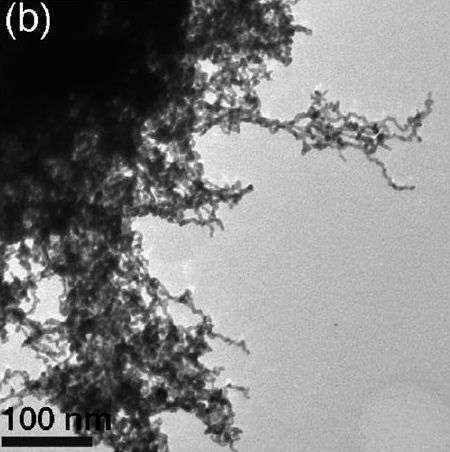 That said, theoretical considerations had suggested that catalysts made of particular metal alloys would display greater catalytic activity and stability and this had sparked attempts to implement those features in an aerogel catalyst. Synthesising a bimetal aerogel, however, has proven to be easier said than done. "This is the first time that an aerogel made of a metal alloy has ever been synthesised" says Thomas Justus Schmidt, head of the Electrochemistry Laboratory at the PSI and co-author of the study. The new results confirm the high hopes for these materials. The key to improving the activity of the new aerogel, for instance, is that the alloy with palladium optimises the bond strength between the platinum atoms and the oxygen-containing species. In other words, the bond is so strong that the oxygen molecules remain adsorbed just long enough for the conversion into water but not too strong as to induce the formation of oxides on the catalyst's surface. The fact that the conversion to water is more favourable than the formation of oxides optimises at each point in time the number of available catalytic centres which in turn leads to oxygen molecules being adsorbed and converted at a considerably high rate. The researchers are yet to understand another advantage of the alloy, namely the greater stability of the bimetal alloy aerogel compared to monometal aerogels made of pure platinum. "Obviously, the presence of palladium in the aerogel plays a key role here, too, but we don't know yet exactly what impact this has on the stability of the catalyst," explains T.J. Schmidt. The scientists would now like to spend the next three years focusing on this and other questions regarding the new nanomaterial in a follow-up project. "We have just finished the draft for a funding application together with Dresden University of Technology to give the project we have been funding internally up to now a broader financial footing." Five times less is still not scalable, because there's not enough platinum for large scale production anyways. Makes no difference if you need 1/5th the platinum, when actually producing fuel cells would increase the demand by 50x so that the same fuel cell would cost 10x anyways. My question is: don't the researchers know this? It's not really their problem. They're just doing basic research, but when the publicity people and reporters ask them "what good is it?" they have to pull up an answer that satisfies the people who ask them. They could try to explain what it actually does, but the reporters will simply latch on to the easy bits and follow it with "...and that's as large as three olympic size swimming pools." It could be useful in a number of other things, but news sites like Phys.org aren't interested in actually exploring the topic of aerogel platinum catalysts, rather they're interested in how sensational a title they can make for the article to generate more ad revenue. The DOE analysis firm Tiax has conducted a detailed analysis of platinum demand to support a global FCEV deployment, and their data show that a 3%/year growth rate in platinum production should be enough. This is approximately the same growth rate that the platinum industry achieved in the 1960 to 2000 time period when catalytic converters were being deployed. Recycled platinum from the transportation sector will be an increasingly critical source of supply. don't the researchers know this? There are uses for platinum fuel cells. They may be highly specialized and therefore are not mass-market applications (e.g. some german submarines have substantial fuel cells they use for power - which have large platinum content). There's always applications where cost doesn't matter and performance, weight or space issues are paramount (e.g. that is why we have relatively costly monocrystalline solar panels on sattelites - even though there are vastly cheaper ones available). So there is a rationale for doing this even if it can't be a widespread application. However the aerogel approach doesn't only apply to platinum (platinum is just used because it's easy to demonstrate good effect using it). So don't get too hung up on the platinum in the article. Won't we be able to redeploy the Platinum already extant in existing anti-pollution devices (catalytic converters) Internal Combustion engine exhaust system? How much per car do we use now? and will the extant pool of redeployable Platinum be sufficient to run Fuel Cell cars without much extra 'newfound' Platinum needed? The current rule of thumb for fuel cells is about 0.8g Pt per kW power (note you don't need as many kW in a fuel cell or electric car as in a conventional one, because you don't have the problem with the power being available unevenly). That still means at least an order of magnitude more platinum is needed. To give you an idea where the problem lies: In 2010 global platinum sales were about 250tonnes. 46% of which went to (car) catalytic converters. So there's not really enough to go around to supply a full fuel cell mobile economy. Thanks aa_phys, Further question: If the current efficiency of IC engines produce much Kw power/energy lost to heat (ie, <50% goes to motive power), then higher efficiency of Fuel Cell to-propulsion-power reduces Platinum need compared to the ICE case? I mean, if half the Platinum in ICE cars is needed to treat half the COx/NOx produced because half the petrol is burnt and lost to heat etc, then a lower proportion of Platinum is needed for equivalent power-to-propulsion Fuel Cell engine not needing any extra Platinum? The catalytic converters don't add to the propulsion so I'm nost sure what you're asking here. I said it badly. Sorry, I am rushed lately. I meant to say that the quantity of Platinum used in catalytic converters is that quantity because it has to handle all the exhaust gases involved. If the ICE efficiency was much higher, then the petrol burned (to achieve similar power-to-wheel output efficiency) would be much less. So using the existing Platinum figure for current ICEs may not be a direct comparison for what is needed in a higher efficiency Fuel Cell engine? That was all. I did not mean to imply that the catalytic converters themselves contribute to propulsion. Thanks for your info so far, aa_phys; much appreciated! Gotta go again. Bye for now. At light loads. Their efficiency drops with higher current densities. If you want top efficiency, you need larger power reserves, which means more platinum. If you want to use less platinum, you get higher current densities, lower efficiencies, and faster degradiation of the catalysts, which means earlier replacement and higher cost. As you said, a fuel cell vehicle doesn't need as high a peak power to get along (aside from if you want to pull things with your car), but if you size the fuel cell to just about that, your fuel economy will be poor and your fuel cell will break down in no time. That's largely why fuel cells are still heavily in development. I meant to say that the quantity of Platinum used in catalytic converters is that quantity because it has to handle all the exhaust gases involved. The quantity of exhaust gasses involved is largely independent from the size of the engine, because the engines spend most of the time doing the same amount of work and their efficiencies are very similiar. The difference between a large engine doing 25 MPG and a small engine doing 50 MPG is just twofold, whereas, as AntiAlias pointed out, a fuel cell car would need on the order of 10 times as much platinum as is present in a typical catalytic converter. Furthermore, the amount of catalyst you need is independent of the size of the engine also for the reason that the purpose of the catalytic converter is to remove products of incomplete combustion, which can be minimized with a better design and operation of the engine independent of its fuel economy or size. ...And vice-versa: the strategically important applied research (like the cold fusion) should always get a priority over clueless basic research. Why? Because we are doing basic research just for streamlining the applied research - not vice-versa. At the moment, when we already have the finding revealed, then we should elaborate the results of basic research into praxis with applied research - or we are just denying the whole purpose of basic research. I'm not certain if I could disagree more, but there is always tomorrow. Basic research is, not to pun on the article, a catalyst to practical application. It may not always make for a pretty sound bite, or make the boys in accounting ecstatic, but it is always worthwhile. I'd put in a qualifier, but even basic research that comes up negative is worthwhile, even if it doesn't make for a riveting publication. When scientists are given a bit more freedom to investigate, you get really unique results. Think Bell Labs. If you want top efficiency, you need larger power reserves, which means more platinum. The figure of merit is g of platinum per kW power from the fuel cell. That stands (as noted already ) currently at 0.8. With the advance proposed in this article we'd be in the 0.1-0.2 range. To get to the numbers where we'd use the sam amount asin cartalytic converters you'd have to get to the 0.05-0.08 range. Which isn't THAT far off. History lessen: it did. It didn't work so after 10 years of pumping money into it it didn't go anywhere. There's a point at which one has to pull the plug on research that is aimed to do something but can't deliver in favor of research that CAN deliver. So what exactly do you need research money for if it already works? Go. Buy stocks in companies building megawatt reactors. Get rich. Be my (our) guest. Or better yet: found a company yourself. Build a reactor. Put it on the grid. There's no need to convince anyone to give you cash, since this should easily finance itself, right? If what you're saying is true and cold fusion works, then the research money pumped into it did exactly what it was suposed to do: get a functioning prototype. At that point research grants are OVER. Then it's your job to find investors/found companies to exploit that. So why exactly should anyone fund research into this again if it works so stupendously well?